Before moving on to Codeception and PHP, we should cover the basics and start by explaining why we need testing in applications in the first place. Perhaps we could complete a project without wasting time on tests, at least this time? Sure, you don’t need tests for everything; for example, when you want to build yet another homepage. You probably don’t need tests when your project contains static pages linked by one router. Your Git repo contains more than a couple commits. You are a proper professional, working on a serious project. You can excuse yourself by saying that you already have a dedicated test department, a group of people who conduct tests and write new ones when needed. But, can you imagine how long bug fixing will take after you add new functionality to your project? First, let’s decide what sort of problems may be solved through testing. You can’t get rid of all your errors with testing, but you can describe expected behavior in test cases. 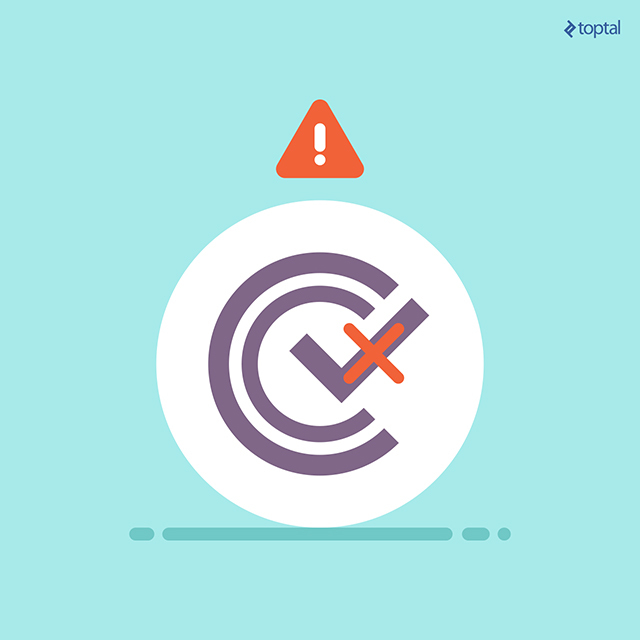 The errors might be inside your test cases. Spaghetti code remains spaghetti code even when you use test cases. However, you can be sure that your code will be changed afterward (by fixing errors, or adding new features), so your code still will be free of errors described in the test. Besides, even well-written tests may sometimes be used in documentation because there you can see how typical scenarios unfold and check expected behavior. We can say that testing is a small but crucial investment in the future. So what sort of tests can we employ? Basic unit tests usually aren't enough. They need to be backed by integrational, functional, and acceptance testing. Unit tests: Low-level tests that check small pieces of your code - your class’ methods isolated from other code. Integrational testing: Integrational tests check a part of your application, they may contain several classes or methods, but should be restricted to one feature. This test should also check how different classes are interacting. 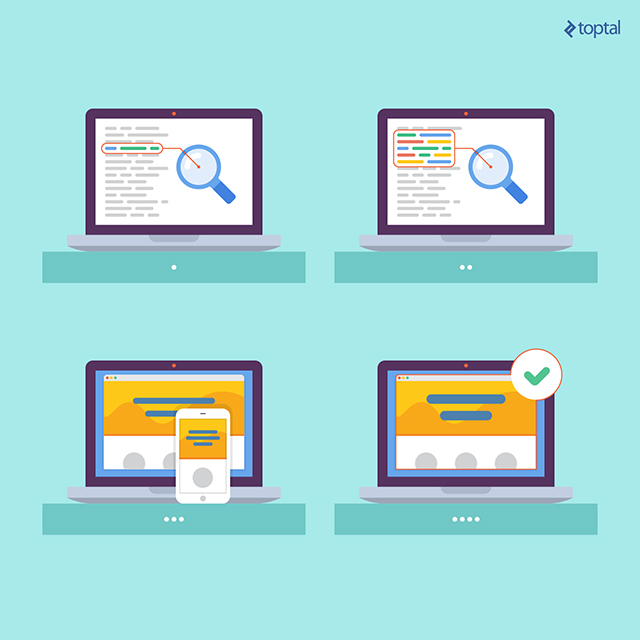 Functional testing: Tests specific requests to your application: browser response, database changes and so on. Acceptance testing: In most cases acceptance testing means checking if the application meets all client requirements. To clarify, let’s say we illustrate the process with something tangible, such as a building. A building is composed of small blocks that form walls. Each brick has to meet specified requirements; it has to withstand the required load, have a specific volume and shape, and so on. These are unit tests. The idea of integrational tests is to check how tightly and accurately the bricks adhere to each other, how they’re integrated into a certain element of the building. Functional tests can be likened to tests on a single wall of the building, to check whether or not the interior is protected from the elements, and whether or not it possible to see the sun through the window. Acceptance testing involves testing the entire building as a complete product: Open the door, go inside, shut the door, switch on the light, climb to the second floor and take a look at the garden outside the building. However, this division is conditional and sometimes it is difficult to resist the temptation of mixing different kinds of tests. Many developers use unit tests and claim that’s enough. I used to be one such developer; I found using different systems for different types of tests too difficult and time-consuming. A while ago, I decided to find something more useful than PHPUnit; I wanted to be better at testing my code, but I didn’t want to read and learn tons of documentation and look for pitfalls. That’s how I discovered Codeception. At first, I was skeptical, as we often are when it comes to something new (this project is five years old, so technically, it can’t be considered “new”), but after playing around with it for a couple of days, I concluded Codeception is a very useful and powerful system. After installing, you will find a new folder named tests in your project, and there will be some subfolders named acceptance, functional and unit. It looks like we can start writing our tests. Cool, but what’s next? Now, try to add a standard acceptance Hello World test. The default variable, named $I, is not just a letter; it is a character. What conducts the tests? The tester, obviously. This tester opens your website’s page or class, does something with it, and shows you the end-result of its actions. You will see what worked and what went wrong. That’s why this object is named $I and why it contains methods called wantTo(), see() or amOnPage(). So, let’s think like a tester would about ways of checking a page’s operability. The first approach is to open the page and search for a phrase. It proves that the page is available to visitors. We see immediately that something is wrong. At first glance, it appears that the message is too long and unclear, but when we look more closely, everything becomes obvious. Whops! Something went wrong. That's the whole point of testing. Check out the message, identify the error, and learn from your mistakes. This is the culprit: localhost is not available. Hooray! Our first successful test! Assertions. see(), dontSee(), seeElement(), seeInCurrentUrl(), seeCheckboxIsChecked(), seeInField(), seeLink(). To all these methods you can add a suffix and use it when you need a method that will not interrupt the test scenario when something cannot be found. Comment and description of test scenarios: amGoingTo(), wantTo(), expect(). Use these methods to get well commented and described tests, which will help you remember the goals of the test. It looks like this should do it, but what if there are some Ajax-loaded parts on the page? Can we test a page like that? The answer is that Codeception uses PhpBrowser, based on Symfony BrowserKit and Guzzle, by default. It is simple, fast and you need only curl to use it. First, you need to install the Selenium driver, change acceptance.suite.yml and rebuild the AcceptanceTester class. After this, you can use methods wait() and waitForElement(). And, more interestingly, you will be able to save your time and resources by using methods saveSessionSnapshot() and loadSessionSnapshot(). This method allows you to store the session state and start new tests in earlier sessions. This is useful in some situations, for instance, in the test authorization process. So, we end up with a simple, yet powerful, ability to test many functions. OK, time to move on to functional testing. No, it is not a mistake. Functional tests should be written in the same way as integrational tests. The difference is that functional tests are interacting directly with your application. That means you don’t need a webserver to run functional test, and you have more capacity for testing different parts of your application. It does mean that support for all frameworks is lacking, but the list of supported frameworks is extensive: Symfony, Silex, Phalcon, Yii, Zend Framework, Lumen, Laravel. This should be sufficient for most cases and most developers. Please consult Codeception’s module documentation to get a list of available functions and then just switch it on in functional.suite.yml. 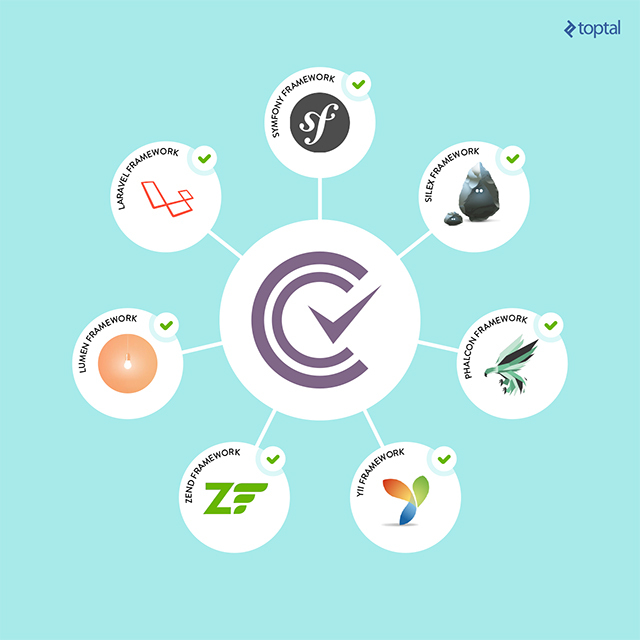 Codeception supports major frameworks: Symfony, Silex, Phalcon, Yii, Zend Framework, Lumen, Laravel. In this example, methods _before() and _after() are run before and after each test. An instance of AcceptanceTester class is passed to each test, so you can use it in the same way as in cest tests. This style of tests can be useful in certain situations, so it is worth keeping in mind. The original article is by Peter Varadi, freelance software engineer at Toptal, can be read here.